What do you do when you are a major Japanese video game maker who faces a shrinking home market and sees the social games sector virtually explode at the same time? You make the jump, just like Capcom, the brand behind such hit games like Street Fighter, Resident Evil, or Mega Man. According to Japanese business daily The Nikkei, the Osaka-based company will start offering games for Facebook as early as next month. Capcom’s US subsidiary (LA-based Capcom Interactive, Inc.) will bring yet to be named titles currently available for the iPhone to Facebook, with The Nikkei hinting that more games are to follow thereafter. 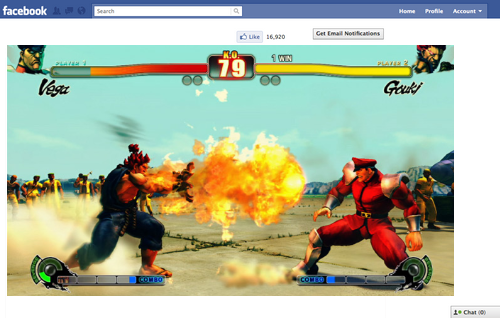 At the moment, Capcom is offering just a handful of iPhone apps, for example Street Fighter IV or Resident Evil IV. The Nikkei says Capcom plans to offer the Facebook games for free but will earn money by selling virtual items, as a lot of other game providers on social networks do. As a start, the Japanese company aims at attracting one million Facebook users from the US and Europe. In Japan, Capcom saw the domestic market for video games shrink for the second straight year in 2009 (minus 6.9% to $6.3 billion). Capcom president Haruhiro Tsujimoto first announced his company’s move into the social gaming business back in May this year. Expect more Japanese video game companies to follow Capcom soon.